If you are looking to undertake a demolition project, whatever the size, then Rabbit Demolition in Sussex can utilise their professional team to undertake the project. Using specialised demolition equipment, a wide range of demolition machines and our own skilled operatives we can tackle anything from small house demolition to large industrial building demolition. We have excellent support and backup from the whole of Rabbit Group. 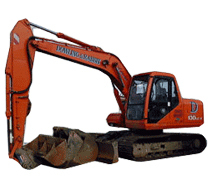 We have access to all the demolition machines and resources necessary for your project. The great thing about us is that as a demolition contractor we will always use our assets wisely, and bring in the necessary demolition equipment to complete your contract on time and within budget. All Rabbit Group companies are absolutely committed to green waste management. Our excellent facility in Sussex allows us to efficiently create energy from waste. Whether you are hoping to undertake a project that requires some form of commercial waste management or a smaller project, you can be assured that the vast majority waste from your demolition site in Sussex is re-used, recycled or recovered. To find out more please contact us or to discuss Rabbit Group joining your demolition project in Sussex as a demolition contractor you can call 01903 762020 to discuss your project requirements.